Be a part of BETJOY Casino and you can gain from the many different games and exclusive welcome offer that is available right here. A joyful experience awaits at BETJOY Casino, where there are so many types of games to play. You can prefer video slots, progressive jackpots, blackjack, roulette, or live dealers and still find plenty of options. Oh, and you can also enjoy access across so many desktop and mobile devices. BETJOY Casino has assembled a vast range of games for you to play. This has been made possible from BETJOY Casino’s willingness to partner with numerous software providers. The skilled bunch is comprised of Microgaming, NYX, Play’n GO, BetSoft, NetEnt, BetSoft, and Pragmatic Play, to name but a few. After signing up, you can start exploring a deep library of slot titles, including the likes of Rage to Riches, Legacy of Egypt, Wizard of Gems, Grim Muerto, Viking Runecraft, Happy Halloween, Tower Quest, and Alkemor’s Tower. If you switch over to the green felt, then you can enjoy playing blackjack, baccarat, casino hold’em, and roulette. Another great aspect of BETJOY Casino is that you can hugely increase your gaming budget by claiming a welcome package that is exclusive to Online Casino Reports (OCR) readers. 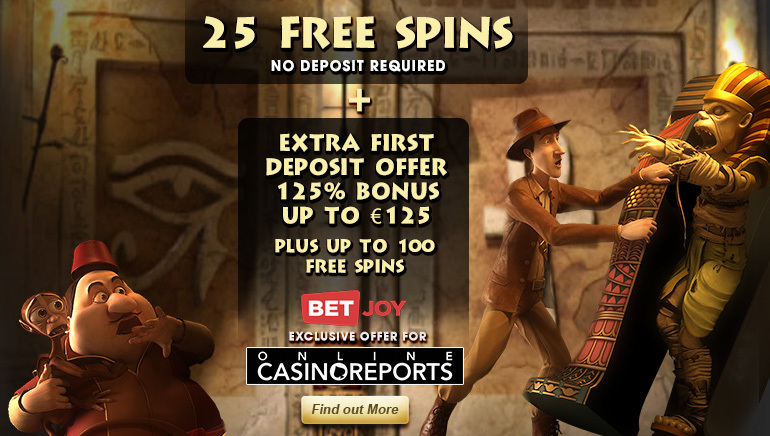 Signing up and depositing through OCR will give you the chance to receive 25 no deposit free spins and a 125% welcome bonus of up to €125. At BETJOY Casino, your deposits will be made securely behind 128-bit encryption software. And that peace of mind can be offered across the principal deposit methods of Skrill, NETELLER, ecoPayz, paysafecard, Yandex, Qiwi, VISA, and MasterCard – make your deposit with BETJOY Casino today.